Sorry it's been so quiet around here this week! Yesterday some friends and I drove 500 miles to Madison, Wisconsin for a "beer-cation" -- a weekend full of brewery tours and delicious cheese of course. I just love roadtrips, such a classic American pastime. Comfort and keeping cool were my outfit priorities, so I wore only jersey and as little of it as possible. Okay, back to World Cup. Cheers! I'm in love with those earrings! And your outfit is basic but cute, polka dots and red just go so well together. I love your top! I really love polka dots. I posted my first video blog yesterday to show my new polka dotted Primark cardigan and polka dot sandals. Maybe you like to have a look at it! LOVE! polka dots are always a favorite. Hope you're enjoying your weekend in Madison! 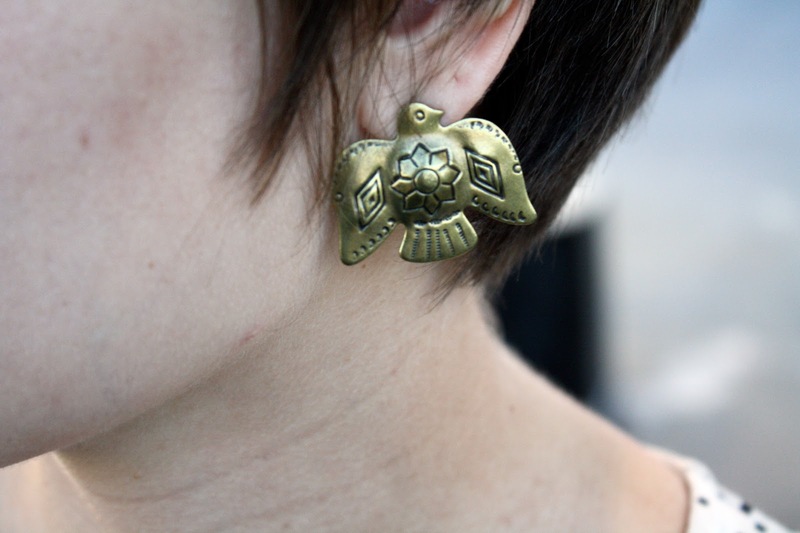 Those earrings are so badass! I'm always on a quest for cool earrings. 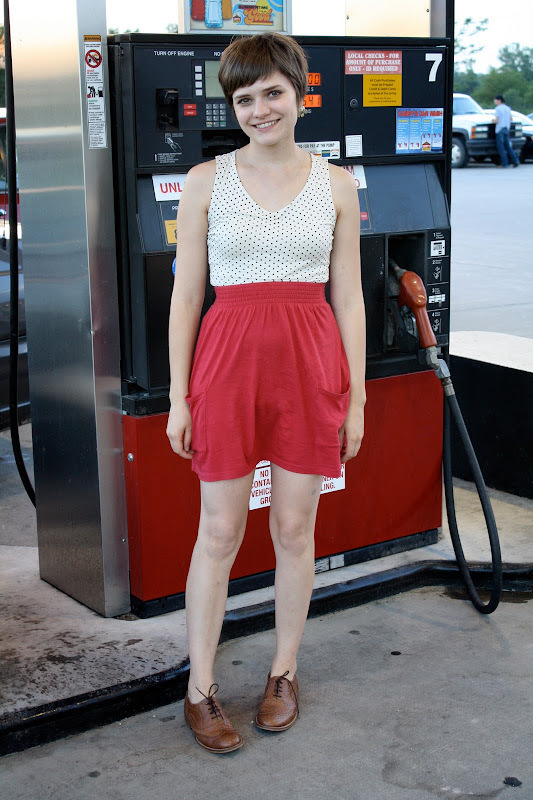 This is the perfect road trip outfit! I'm loving your top's cut-out back and your fantastic oxfords. That sounds like the best road trip ever. You look super adorable and comfy. Have fun! Love, love, LOVE the earrings. I went to school in Madison--hoped you enjoyed your time there! Road trips are the best. I want those shoes so badly!!! Adorable. do you have a tattoo?? i hate driving, but i love roadtrips! :) it is a great way to see different parts of the country. Ditto on the love for the earrings. Dude, crazy. Joe and I were in Madison all weekend running around, getting sunburned, eating ice cream, and drinking beer!! i have been trying, trying so hard to like beer! i have tried all kinds, but none suit my fancy so far. bahhhhh! Great article on dressing trends. If you are looking for a plus size casual dress. I will highly recommend to visit the site www.kaneesha.com from where I purchased few dresses. They have a wide range of dresses. very very adorable red, high-waisted shorts and polka-dot top with fun and flirty back cutouts. Aw, I love Madison! I used to live in IL and was a frequent visitor for the cute shops and, of course, the cheese (I was too young for beer at the time!). Hope you had a blast!